Because what I was looking for was a set of cabinetmaker chisels and not the perfect on site construction chisel that also would be used for opening beer and cans of paint! This is actually meant as a compliment because the Bahco 343 is a wonderful chisel for construction work, it is strong due to the high sides, thick, holds a excellent edge with a double bevel of 30 degrees and 5 extra for the second (then they can take serious beating), have this split proof handle and a shiny polish that keeps rust away and makes sure all corners except the cutting edge is smooth a round. So they will not be sold but become my low bevel beat up out of the house chisels. A cabinet makes chisels should be; thin so it can get into the corners, light, hold a strong edge but be fast and easy to hone (not re sharpen), and be able to hold a strong edge on a low angel app 25 degree single bevel (for this you need A1 steel not A2 that are perfect for the hardworking bevels), have a nice handle that are comfortable to hold, low sides so it can get into a corner or clean out a dovetail and long blade for paring – and all this fits the MK2’s. Besides this they look excellent after my taste, they are elegant sturdy and crisp, actually a bit feminine I think, but not as feminine as the Stanley 750’s (this is a compliment to both). To me this is all in the design and the finish, I love the Old English pattern they are so elegant, I love the simple handle shape, the marks from the lathe spindle at the end of the handle that gives it back it’s masculinity but most of all the blade that are hand ground in England from a old Sheffield family business, this leaves it with a special touch that no machine made tool will ever get, a soul right from the birth – this is to me priceless (to others it is a disaster and they will do all to polish the wood and the steel to make it look like a woman’s jewelry never touched by a human hand, some even prefer a plastic handle so there are absolutely no life left). This is as good as it gets for a set of cabinetmaker chisels in my humble opinion. If I should give them a critique it would be that they could have used some a little thicker brass ferules, since they look less sturdy than the rest, and then they should put up the price a little so the price match the quality! I paid app. 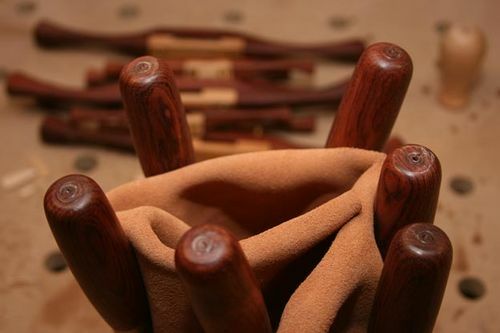 300 US dollar for the set including shipping from the UK, and a wonderful tool roll in the sweetest suede, what I consider an extremely fair price for a set of Handmade English cabinetmaker chisels that will serve me and probably a generation or two more of hobby woodworkers after me. (Even that I am living on an architect’s pension). Now all I need is a second set of chisels with shorter blades and harder steel that I can set up for beating so I can get rid of the plastic handles in the shop. So full number of stars for the Ashley Iles Mk 2 Bevel Edged Cabinetmakers Chisels. The Mk2 Bevel Edged chisels from Ashley Iles embody everything that an English cabinetmakers chisel should be. They are thin, light, exquisitely balanced, almost shoulder less, have a low 23 degree cutting bevel and the backs are intentionally ground concave by 0.1 to 0.2 of a millimeter over their length. PLEASE DO NOT LAP THEM COMPLETELY FLAT! This concavity is too small to have any impact on the accuracy of the tool but is sufficient to ensure that you can polish both of the surfaces that form the edge in a matter of seconds. The 23 degree primary cutting bevel is optimized for paring cuts, the chisels are also perfectly suitable for chopping but we recommend honing a small secondary bevel at 30-35 degrees before you use them in this role. Forged from Sheffield O1 High-Carbon Steel: C1%, Mn1%, Si0.25%, Cr0.5%, W0.5%. Fitted with sustainably sourced Bubinga handles and solid brass ferrules. In the 1950’s Sheffield Patternmakers were somewhat unimpressed with the quality of tools that were available. 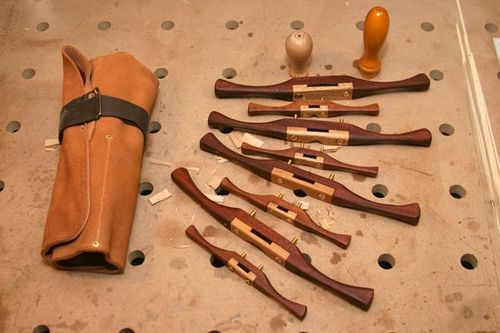 One of them, by the name of Ashley Iles, set out to remedy the problem by abandoning his Patternmaking career and setting up shop as a tool manufacturer. With help from the ’little masters’ network of specialized tradesmen, who were only too willing to share their skills with him, Ashley’s business and reputation prospered. The company is now managed by Ashley’s two youngest sons Tony and Barry, who along with their growing staff of highly trained specialists and apprentices, continue to manufacture tools in the finest traditions of the British Tool making Industry. A good set of chisels are the foundation of any woodworker’s tool kit. If you want to produce fine work, then the emphasis is very much on maximizing control; you should be able to feel the timber through the chisel without being overly conscious of the chisel itself. 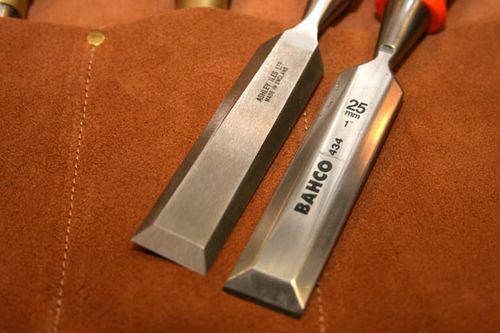 The Mk2 bevel edged chisels from Ashley Iles have all of the qualities that define good English cabinetmakers chisels. They have light, very thin blades that taper to almost nothing on the sides but are still plenty strong enough for gentle tapping with a mallet. Exquisitely balanced and responsive to the lightest of touches, they are delivered razor sharp and require little or no work on the backs. They also come with a cast iron, rock solid, no questions asked, lifetime manufacturers guarantee, and if you ever do get a ding in one of them, you can even send it back to the factory with a couple of pounds to cover the postage and they will regrind and hone it for you free of charge. This is why you DONT want a completely flat back. I own them as well, and love them. I also agree with you that the Bahco’s are a fine utility chisel, but they don’t talk to you like the Iles do. I, too, would love to see a very stout ferrule but I can’t imagine that it affects use in any way. Congratulations on this fine set! Lol. Damn another thing I need. I was thinking of looking at the Stanleys, currently I am using the blue handled marples. I had been hunting for an old set of the Stanleys but was not having much luck. I agree with the ferrules it’s only design talk. And as you can both see on the last picture I was as happy as a child on christmas evening when I got them, infact they are in my living romm now! (I brought them back from the shop again), since I cant be in the work shop these days and need to look and touch once in a while – the truth is I have never feelt so saticfied with a new tool as with these ever. Mads they are a wonderful set of chisels. Mads, on occasion, I’ll score a vintage chisel with a ferrule almost 1/4 inch thick! The ones I buy from Lee Valley to rehandle chisels are a lowly 1/16” chick. It’s a particularly satisfying feeling to buy a NEW tool that excites you like an old one. I’m happy that you love these chisels and I know you were after them for a while. Great review of these chisels. 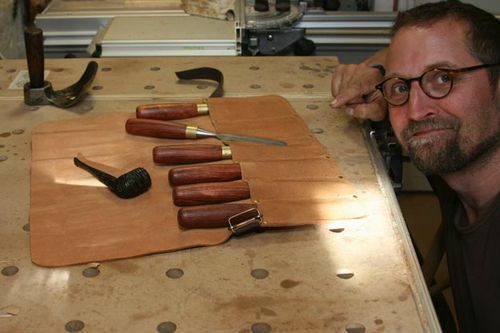 That is probably what my next major hand tool purchase will be is a fine set of chisels. I would prefer to get my hands on a complete set of old Swann bevel edge socket chisels, but if not, something like these would do very nicely. Thanks for posting. Bertha, I know what you mean about those ferrules. I enjoy restoring old hand tools and when I take an old chisel and fit a new handle to it, I actually use brass plumbing fittings. I got the idea from another online site so the idea is not original to me but it works great. They aren’t as cheap as the ones from LV, but it really looks nice when it is done. Hey Doc, thanks for this tip! That never even occurred to me and I really appreciate it. Now you’ve got me thinking about James Swann. I’ve got quite a few Swanns that I prize, even his drawknife that I have a hard time leaving alone. They are absolutely fantastic but I’ve got to tell you, these Iles are of similar quality. The heft and balance is quite similar. Of course, we’re talking new versus old and old usually wins out with me. These chisels have surprisingly good character for a modern tool. I think you and Mads both understand me when I describe that little electricity that pulses when you hold a prized chisel. Happy chisel hunting! Yes I understand. These chisels are the only chisels I know of high quality that give you the feeling of beeing more than just the materials they are made from as new. It’s a feeling of warmth, love life… I was quite exited to get them since it was the feeling they gave me on the photos, and I was only positivly surpriced when I got them in my hand. 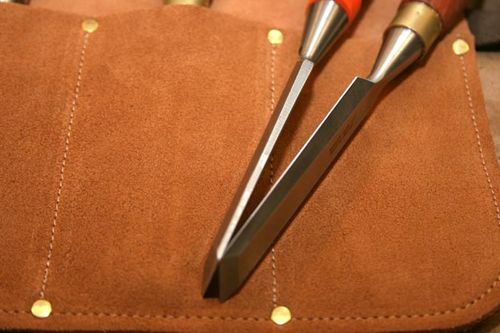 I love them, it is really that simple, I would trade them fo no other chisels. I just restored a set of old French mortice chisels I will post soon, they are from the old French armys swordmaker. These are cool. “Oh come on guys, they’re just chisels!” he said as he turned to run. Seriously though, thanks for the review Mads. Not that I can afford a good set of chisels yet, but they are definitely on my short list.